The study published in the August issue of the Annals of Neurology brings crucial attention to iodine supplementation, something the medical community has recently begun to frown upon up to the point of creating a phobia against oral iodine. It was an ill designed Brazilian study that is used by doctors as a reason to stay as far away from iodine supplementation as possible. I have actually talked to a Brazilian doctor who went ballistic with just me mentioning the word iodine! Dr. Gustavo Roman, with the Houston Methodist Neurological Institute and researchers in the Netherlands, studied thousands of pregnant Dutch women and found a lack of iodine in their diets affected fetal brain development. “I think for the first time we have the possibility of finding an explanation of the problem but most importantly we have a way of preventing this from happening,” says lead author Dr. Roman. The most common cause of thyroid hormone deficiency is the lack of iodine in the diet. Researchers in this study believe that one in seven Americans is believed to be iodine deficient but Dr. David Brownstein has tested 5,000 of his patients in the Detroit area and has found over 90 percent to be deficient. of my patients are deficient in inorganic iodine. Dr. Roman said, “I think it’s very important that women of reproductive age measure the amount of iodine in the urine it’s a very simple test and if the levels are low they need to go back to using iodized salt to prevent this from happening.” The problem with his suggestion is that there is little iodine in iodized salt and what is there evaporates rapidly when sitting on the table leaving nothing to absorb. in a permanently lowered IQ as well as thyroid problems. Pregnant and nursing women need 220 to 290 micrograms of iodine a day, according to the Institute of Medicine. Tests on 60 brands of pre-natal vitamins that listed iodine as an ingredient on their labels found many fell short of the stated amount. 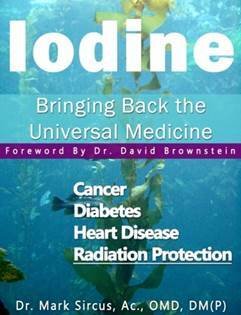 In my book, Iodine—Bringing Back the Universal Medicine, we see that much higher levels of iodine supplementation have been used in studies since the early 1900s. Dr. Brownstein uses between 200 and 300 milligrams of iodine daily, with higher doses for more serious and difficult diseases. The 11th edition of the 1910-1911 Encyclopedia Britannica cites the “usual” doses of 300-900 milligrams (300,000-900,000 micrograms!) of iodine daily. “At 6 grams daily (which is 6 million micrograms/day or 6,000 milligrams/day! ), a much higher dose, iodine has been used to cure syphilis, skin lesions, and chronic lung disease,” says Dr. Cousens. “From a larger physiological perspective, it is important to realize that the thyroid is only one gland of many glands and tissues that needs iodine. Other glands/organs/systems with high iodine uptake are the breasts, ovaries, cervix, blood, lymph, bones, gastric mucosal, salivary, adrenal, prostate, colon, thymus, lungs, bladder, kidney, and skin. Iodine is found and used in every hormonal receptor in the body,” he states. Dr. Roman encourages women who are pregnant or who are trying to get pregnant to take prenatal vitamins that contain iodine. Again this is a bad suggestion for iodine is best taken as a standalone supplement not as part of a multivitamin formula. The best forms of iodine are liquid. Nascent (atomic form of iodine) or Lugol’s iodine. Both are ideal for children and adults alike. My favorite iodine and the one I personally use is Nascent Iodine from LL’s Magnetic Clay. Nascent iodine is iodine in atomic rather than molecular form and traces its history back to Edgar Cayce. It is an iodine atom that has an incomplete number of electrons meaning it can hold an electromagnetic charge. 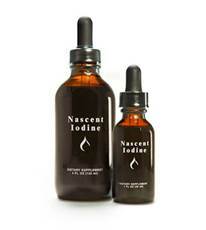 Nascent iodine is recognized by the body as the same iodine that is produced by the thyroid so it is absorbed effortlessly by the body. 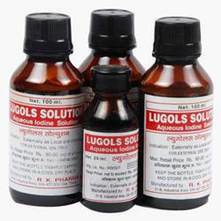 It is not inexpensive so I always also recommend Lugol’s and any other iodine even if in pill or topical form (marked for topical use only – to be used on the skin only….not for ingestion) if there is no other iodine to be found. Even topical applications can be effective.